In 1952 Ibrahim’s village, Beit Ummar in the West Bank, was still under Jordanian control and Ibrahim’s father bought some land to add to the rest of the family’s land which had been theirs for generations. When Ibrahim’s father died in 2002 Israeli soldiers and settlers said that he had sold the land to them and that they had papers to prove it. This was the start of a long struggle as Ibrahim strove to prove that the land belonged to him and his family. Eventually he was able to prove in courts in Jordan and Palestine that the documents the soldiers and settlers had produced were a forgery. 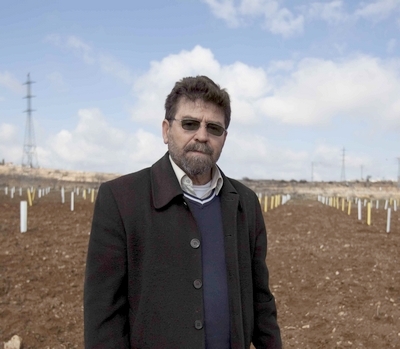 Going to court was costly and although Ibrahim proved his case, his land remains at risk of confiscation as it is depicted as ‘an integral part of Israel’. Ibrahim has not given up the struggle to remain in possession of his land although he has been arrested 17 times and tortured on four occasions. He affirms that he will resist any attempt to take his land from him. Planting trees protects the land from confiscation and reminds Ibrahim that he is not alone in his struggle.